Samsung is expected to launch at least one new tablet at MWC 2017 in Barcelona at the end of the month, and the latest leak suggests we’ll see the Samsung Galaxy TabPro S2 break cover. The slate appears to have passed through US regulator the FCC, and in the process pretty much all the specs for the TabPro S2 have been revealed. 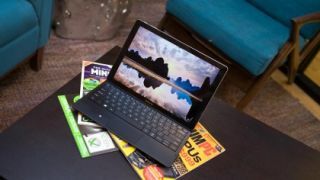 It would follow on from the Galaxy TabPro S, which means Windows 10 rather than Android on-screen, while a leaked spec list points towards a 12-inch QHD display, Intel Kabylake chipset, 4GB of RAM, 128GB SSD storage, 13MP rear camera, 5MP front snapper and a 5,070mAh battery. It’s also tipped to sport two USB Type-C ports and a SIM slot, with S-Pen and keyboard inputs also supported. A direct rival to the Microsoft Surface Pro 4 and iPad Pro, the rumored Galaxy TabPro S2 is likely to have more of a business slant, with its 2-in-1 capabilities (both a tablet and a laptop) being pushed to the fore. We will be reporting live from MWC 2017 from February 25, including from Samsung’s press conference on February 26, to bring you all the latest from the show.